1 of 4 Remove seasoning packet from rice mix. Measure out 1 teaspoon and sprinkle over both sides of chicken in a glass dish. 2 of 4 In a bowl, combine beans, scallions and jalapeno. Dice pineapple chunks (reserving juice) and add to bowl. Pour 3 tablespoons reserved juice over chicken. Stir 1/3 cup of the diced tomatoes and 1/4 teaspoon of the rice seasoning mix into the bean mixture. Add vinegar and oil; stir and set aside. 3 of 4 Prepare Rice. Heat butter in a large, lidded skillet. Add rice mixture. Saute over medium heat, about 3 minutes. Stir in 21/4 cups water, remaining seasoning and remaining diced tomatoes. Bring to a boil. Cover and reduce heat to low. Simmer 20 minutes. 4 of 4 Heat grill or grill pan. Once ready, grill chicken 3 to 4 minutes per side, turning once, or until cooked through. 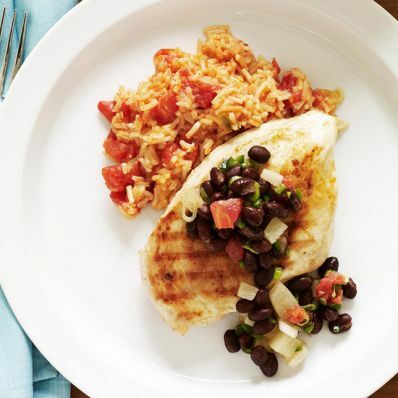 Serve chicken with salsa and rice.